More sales activity means more sales. But if you’ve ever banged your head against your desk in frustration after failing to motivate your sales team to make more calls, find more prospects or close more deals, you might doubt other’s understanding of this simple truth. Based on my experience running a 100+ person sales team and consulting to CEOs and sales leaders, there’s no silver bullet. Instead, increasing sales activity requires a mix of approaches. In fact, sometimes, the simple fact that a company has deployed a variety of approaches is what does the trick. Turns out, variety isn’t just the spice of life — it’s also the key to increasing dials and dollars. Over the last few weeks, I asked 20+ sales experts the question, “How have you successfully increased sales activity?” My interviews yielded a variety of tried-and-true methods and a few I’ve never considered, but will in the future. If you’re not measuring sales activity, you stand little chance of increasing it. In fact, you wouldn’t even know if you did drive an uptick. If you can afford to buy a billboard in Times Square or a Ticker on CNN that scrolls your sales rep’s performance in real time, do you think they’d be more likely to pick up the phone? Most would. But, you don’t have to scorn your team in front of the whole world to compel action. Even if the leaderboard is only seen by a few people, no one likes being at the bottom. TVs in the office so executives can glance at the numbers as they walk past your team. On a desktop dashboard so everyone can reference it during the day. On your mobile phone so you and they can check it while in a meeting, on the road or as you get out of bed in the morning. Most CRMs make it fairly easy to measure your team’s activity. Below is a dashboard that shows sales activity by sales rep against goals and historical performance. 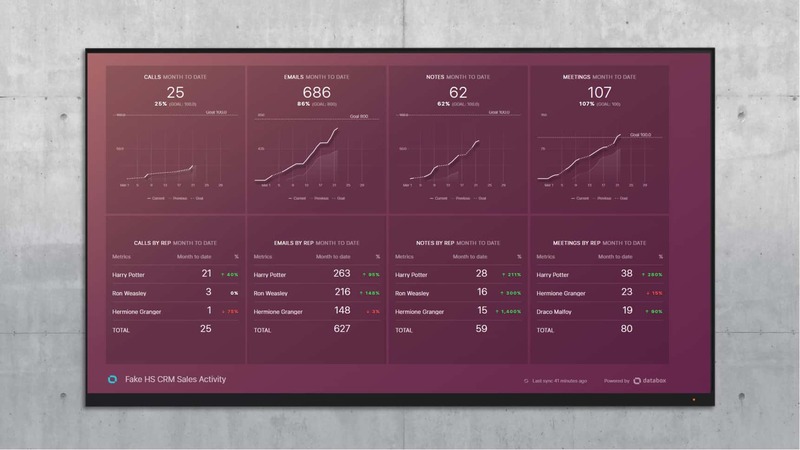 It’s a Databox-powered dashboard that shows data from our connection to HubSpot’s free CRM. The tables in the bottom row show the performance of each individual salesperson for those same metrics. On the cumulative month-to-date line charts in the dashboard, this company set activity goals for each activity (calls, emails, notes, meetings) that show up as horizontal goal lines. This team is closing in on their monthly meeting target, but way off on their call target. Before rolling out a dashboard like this, you must calculate the targets that will get you to your quota. This team doesn’t pick up the phone very often, but sending emails seems to get them enough meetings. We could argue that they should pick up the phone more and their goal certainly shows they’re behind on this metric, but they seem to be able to get the job done without it this month. Your situation might be different. This team has a plethora of inbound sales leads. If you’re cold calling, your call numbers can’t be anemic like theirs. I’ve found that sales reps are more motivated to increase activity if they know what activity volume they need to achieve their personal income targets. The math isn’t difficult to do. You need to calculate how many calls and emails, meetings and deals they need based on their commission rate, funnel conversion rates and average deal size. You may need to run the calculations every once in awhile or at least make sure the inputs to your calculations don’t change that drastically. When I lead a large team, we found that rep’s conversion rates and activity varied drastically between each other and month to month. So, we produced reports monthly that allowed us to monitor each rep’s conversion rates and throughput, which helped them figure out how much activity they needed each month to hit their goals. My former boss and Databox investor, Mark Roberge, covered this thoroughly in his book, The Sales Acceleration Formula. It’s easy to over-optimize on the wrong activity. My default sales advice is usually to put more deals in the top of your funnel. But, that doesn’t work for companies who have a finite set of prospects. Many managers think that closing is the key activity and they force their reps to close early, close often and close “5 times before they give up.” I think that’s horrible advice in most situations. Don’t let your biases cloud your judgment. If you do, you risk getting your reps to focus on the wrong things too. When you over-optimize the wrong activity, reps might forget about other complementary activities that lead to sales. Then, your wrongly-selected activity focus could cause the opposite of your desired effect. While individuals are motivated by different things, don’t overlook the value of setting a team goal. If you’ve done a good job of aligning the company’s mission with your sales team’s targets, individuals will be more likely to understand that they’ll do well when their team and the company does well. I’m not a fan of meetings for the sake of meetings. When most of my team was exceeding activity and revenue targets, the last thing any of us wanted to do was have a meeting where we looked at numbers. But, combined with a meeting on other topics that are helpful for the team like product or company updates or best practice sharing, walking through the numbers is a smart five-minute activity. To make these meetings effective, I recommend asking everyone to share their plan for the week. If a rep is continuously missing their targets, you have a problem. But, if team members have bought in to your plan, they will take their commitments seriously. Of course, as Braun suggested, hold your reps accountable in 1 on 1s and via leaderboards too. A HubSpot sales rep, Evan DiLeo, shared a novel approach that worked for his team. HubSpot managers review numbers in 1:1s and at team meetings. In addition, DiLeo’s team implemented a concept called Accountabili-buddy, coined by leadership coach, Jeremiah Miller. Personally, I was never motivated by activity contests unless the prize was enough cash or stock to help me achieve my longer-term personal goals. But, I’ve used contests to increase activity plenty of times and some salespeople are very motivated by winning even small prizes. Jake Fisher from Bridges Strategies suggested something similar to Richardson. Most sales people know the Glengarry Glen Ross “coffee is for closers” line, but Jake adjusts it like this: he doesn’t get coffee in the morning until he’s made five calls. “That one thing can inspire others to do the same,” he shared. You can pound the table telling your salespeople they need to do more. I’ve even heard of a sales leader who gave a “peace time vs war time” speech suggesting that now was “war time” and the teams needed to step up and deliver for the company. This stuff rarely works in my experience or does so only for short bursts. In fact, this speech precipitated an exodus of several of this sales leader’s team members. Investing in a sales rep’s development is a much better way to increase activity. If they are more confident they’ll be successful, they’ll be more comfortable making the calls. Plus, if they feel the company is helping them develop, they’ll be more interested in helping the company be successful. “The power of sharing best practice calls and emails has had an exponential impact on team activity and results.” claims Richard Smith, sales leader at Refract.tv. “Giving my new sales development reps (SDRs) great examples of personalised interactions – with context as to why they are great – gets them exposed to the skills they need to achieve results.” By doing this as early as their first day on the job, his rep ramp time has been much quicker. “Each salesperson is an individual with their own combination of strengths, weaknesses, skills, fears, obstacles, challenges, dreams, experiences and circumstances” said Rick Roberge from sales coaching firm, Unbound Growth. As a former client of Roberge’s 10+ years ago, I still remember the conversation where Roberge help me set my personal sales and life goals, and helped me ensure my short term activities would lead to the achievement of them. Defining and communicating those goals motivated me for the next ten years of my career through tough times and the very tough times. For example, Roberge shared a story of another one of his clients. When Rick asked, “Why would you want to hire me?”, his answer was not convincing, “There’s always room for improvement.” Roberge dug in but he couldn’t get the rep to open up. Roberge declined to coach him, telling him, “He hadn’t failed enough yet.” But, that’s when the rep finally admitted his personal reason for wanting to do better. Turns out, his wife was pregnant and due any day and she wanted the option to not go back to work. After coaching from Roberge, the rep was the top performing rep at the company the next year even after taking over a month off when his baby was born. “His new baby gave him the incentive to change no matter what” Roberge added. Many salespeople don’t prospect or close enough because they don’t think they can or aren’t comfortable doing it. They might even be fearful of rejection or failure. To get them to do it, you’ll need to coach them. While, some coaches suggest you should focus on developing a rep’s existing strengths, I think that’s just plain wrong. That’s like saying an elementary-age school kid should only focus on the subjects they enjoy. Sales is a profession, just like any other, and all adult professionals need to be open to eliminating their blind spots. I’ve seen first-hand the impact effective coaches can have on a rep’s performance by focusing on replacing bad behavior with good. Gain insight from multiple data points. Demonstrate what you expect to be done. Dedicate time to helping reps fix their problems, not just their deals. Don’t push your reps to increase activity, just for the sake of it. Don’t forget to recognize and reward reps who are efficient with their time too. Most of the time, sales people and sales leaders focus on the wins: calls that went well, deals that closed, reps that crushed quota. In addition to that, celebrate when reps avoid spending time with people who aren’t qualified. Carole Mahoney from Unbound Growth framed it up this way, “Sales people spend entirely too much time with the wrong people, or people who won’t ever buy from them. Inflated pipelines don’t just throw off revenue forecasts, they give salespeople a false sense of security, which leads to inactivity, which further perpetuates the problem.” Mahoney recommends focusing on disqualification as much as qualification. Want to know the oft-overlooked reason HubSpot grew customer count as quickly as it did? Lead intelligence. Yes, the marketing team generated literally millions of leads over the years. But, the key to efficiently converting those leads into sales was knowing which ones to call when. HubSpot’s marketing software tracks how leads found your website, what pages they viewed, when they revisited and much, much more. Using our own software, we prioritized who to call and when to call them. By providing lead intelligence to your team, you can drastically increase their connect and close rates. This will increase sales activity and also make more activity less necessary. Sometimes, working smarter makes more sense than working harder. Sara McNamara uses Pardot data to help the sales team craft personalized emails after reviewing a contact record in Salesforce. To implement this tip, you must subscribe to a prospect spying service. Just kidding. There’s no such thing — that I know about, at least. However, there is a way to know when your prospects are more likely to read an email or pick up their phone. 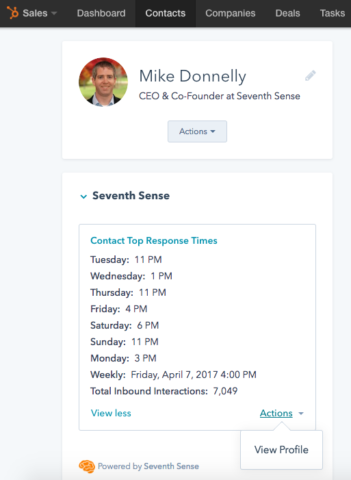 SeventhSense, an email send time personalization software, also helps sales reps make well-timed calls. By tracking when your leads visit your website and open your emails, Seventh Sense builds a profile of them that determines when they’re more likely to be at their desk. If you use HubSpot CRM, they can put this data right in front of your sales reps. Then, your reps can call when the prospect is more likely to pick up and time an email so that it’s more likely to be read. See what it looks like in the screen grab below. I’ve found that salespeople will revert to the activities that provide the easiest path to their sales target. Often times, unfortunately, that means sending the same message to every prospect. Few put much creative effort into prospecting, preferring to try the same positioning statement on every initial call and the same email message for every prospect. This is a recipe for failure and has lead to single digit response rates for many sales teams. Why sales teams accept a 90+% failure rate as acceptable is beyond me. Frustrations with lack of results will prevent salespeople from taking on further activities. Give them tools and campaigns that help them achieve prospecting success. One way to keep your reps busy is to eliminate the option for them to sit idle. To do this, make prospecting someone else’s job. While I believe all reps should make filling the top of their funnel their top priority, sometimes it makes sense to just book appointments on their calendar too. If your inbound traffic is relatively high, you should encourage your website visitors (or email subscribers) to book time with you using a tool like Drift’s Meeting Scheduler or HubSpot Meetings. But if you don’t have a lot of website visitors yet or if you need to call on a more targeted list of accounts, try using a system like VOIQ to automate your call channel. VOIQ is marketing automation for sales calls. To trigger phone calls, you can either upload a target list of contacts to the VOIQ system or hook it up to HubSpot or Salesforce to run more timely call campaigns. With marketing automation systems, marketers have been triggering targeted emails based on what a prospect does or doesn’t do, for more than a decade now. VOIQ gives marketers the ability to trigger a phone call – along with an email – based on a prospect’s behavior. You design your call script, trigger the phone call and VOIQ’s representatives make the call. You get a recording of the call and a completed questionnaire based on the questions you’ve included in your call script — and if the call goes well, a booked appointment for your reps. As you can see in the video below, VOIQ even integrates with HubSpot’s Workflows tool, allowing marketers to set up as many call scripts as they want and triggering different call scripts based on the prospect’s interest. With VOIQ, you don’t have to wait for your salespeople to pick up the phone and call leads, they get qualified appointments on their calendar. As a bonus, VOIQ allows you to measure the success of different call scripts and their AI will even help you improve the script over time to get better results. How Will You Increase Your Team’s Sales Activity? If it’s not clear from this list, there’s no shortage of ways to inspire, motivate, compel or cajole your team to increase sales activity. But, too often, I see sales leaders resort to a few, standard, shallow, short-lived tricks. If your sales team isn’t performing, take a look at yourself first. Maybe you need to up your game a bit before they’ll up theirs. If so, start by measuring your rep’s activity, define the activity needed to achieve your (and their) goals, then coach and enable your team more effectively. And the next time you think about running the same old activity contest, consult this list and think about how you could try a few new angles. Within every motivated sales team, you will find a good, well-rounded sales leader. What have you tried? Now that you’ve read this list, what might you try now?